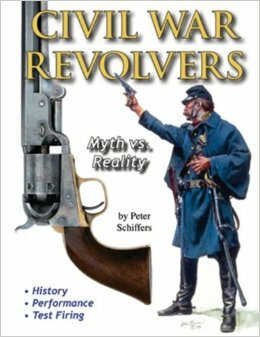 My copy of this new release by Peter Schiffers arrived yesterday, a worthy companion to his previous book “Civil War Carbines – Myth vs Reality”. Like his previous book, Schiffers is going to put some noses out of joint with his opinions and findings. Most of what we know about the pistols of the ACW era is from period “testimonials” and maker PR which need to be regarded with suspicion. Nothing new about that. The shooting (conducted by a European master with BP revolvers) utilized historically correct bullets, powder charges and lubes. This means conical bullets as opposed to the more commonly used RB of today. He also used 1-1/2 g (closest granulation to the historic ‘musket powder’ used in the era) as opposed to the modern use of FFFg. The guns were rated on accuracy, efficacy of loading, effects of fouling and even quality control of the samples tested. His findings will surprise and even offend the biased opinions of some, as did his findings on ACW carbines. If your experience and opinions on these guns is solely based on modern repros, you may similarly be upset by his findings. I won’t give away the top rated three and the overall rankings, but based on my experience shooting cap & ball “Frontiersman” for the past few years, I tend to agree with his ratings overall.